“UP PERISCOPE” By Robb White. (Fiction) American submarine USS Shark is sent on a perilous and top-secret mission into Japanese waters. It was 1943, the tide of World War II had not yet begun to turn in the Pacific. Lieutenant Ken Braden, fresh from Underwater Demolition School was aboard Shark headed to a remote Japanese held island to sneak ashore and steal a much-needed enemy code book. White’s book “Up Periscope” became a major motion picture of the same name, staring James Garner. 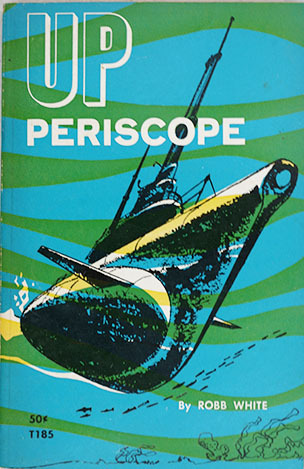 1968 Paperback edition. 220 pages, 1 illustration, no photos, maps or index. Book measures a small 6 ½ by 4 ¼ inches. This title has become very difficult to find and still very popular. NOTE: Small half inch square (just above the 50 cent mark – see photo above) on the book cover where the printed surface of the paper has been torn off.